For anyone for whom a well-dressed ankle is serious business and for those of you who longed for over-the-calf argyles or horizontal stripes but couldn’t find them readily available, Mr. Kabbaz’s emporium is a gold mine. I trust the man so much that I would skip the trip to Charvet and let him make my shirts, if only I could afford him. The website design may leave much to be desired, the man and his merchandise does not. Head for Customshirt1.com and wiggle your hand-linked toes with glee. This entry was posted in Elegantology and tagged clothing resources, Elegantology. Bookmark the permalink. 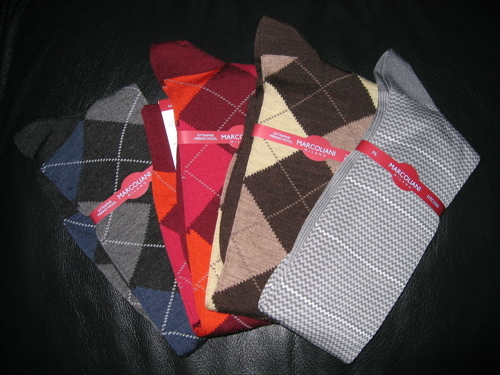 Love patterned socks to add a pop – especially ones that go over the calf. Now do you also wear bow ties or did I miss that post? Hello Mrs. PvE, Me, too. Over the calf or nothing at all. I got some really fun socks in Rome at the same place the Pope gets his! They’re bright red. Fairfax, I’m jealous. Just the thing for that black tie country club soirée (at least in my case..) Did you get some of those smashing slippers he wears, too? HAHA! Not the current pope, the last one. This one sounds like he’s from Hogan’s Heros. They put up a huge firewall at work, so i am sporadic on blogs these days. Miss ysa! You’re welcome without advance warning at any time, Fairfax. Catch as catch can. Check out Frank Rostron, custom shirt maker from England, who visits the US regularly. My husband receives a new Frank Rostron shirt every Christmas – they are wonderful. Ah Aesthete, leave it to you. Thanks for the source. Aesthete is right! That’s the place we went. I’d forgotten the name.